Use The Best Pattern Design, Grading, Marker Making & 3D Animation Software – Be efficient → Save Fabric → earn more orders by being competitive → Pay Salaries from saving fabric in cutting room & not earning’s → Invest earning’s for expansion & up gradation → It makes sense, right. ApparelOrb brings you The Best Pattern Making & Grading Software – StyleCAD – a state of the art technology application with high performance Pattern Making, Grading, 3D fit simulation & Fabric saving tools. StyleCAD Pattern Designing Software is laden with so many distinct features for ease of use to make mundane tasks much easier & interesting for pattern makers, designers & technicians. It is not just another CAD Software, this is what we call a smart software that is loaded with so many multi specialty tools & features which makes your pattern drafting much easier and quicker when compared to other pattern making software’s. Pattern Xpert is the killer application that everyone has been waiting for. If you are anyway connected to apparels, either it be garments, leather, lingerie or sports industry and if you are enthusiastic to the ever demanding competitive apparel market and are always on a look out for the ways to improve work efficiencies and fabric utilizations, you would never want to miss a chance to have a presentation once and adore the product. Most of the times many exporters, fell into the trap of marketing gimmick and opt for just any software that is marketed cheap, without exploring thoroughly. They keep price as primary fixation & product/ quality as secondary. But we strongly insist & recommend everyone to consider other way round. We consider software purchase as a binding, that doesn’t happen anytime or every time just like that. It should be a very thoughtful decision that shall be taken very carefully while exploring all opportunities, services & support that comes along with it. Our software & hardware technology holds an upper hand to any other software, either it be for Pattern Making, Fabric savings or fast fit approvals through 3d renderings. What’s more, it be for retail business, custom made apparels, leather industry, domestic or export productions, it is beneficial for one and all. Selection of Pattern Making software should be a very thoughtful and selective decision, by virtue of which one can benefit in keeping check on company overheads, time, fabric resources. But many a times people fell trap of sales/ marketing tactics and buy something which is not worth its value and repent later. Even after possessing a CAD software they are forced to follow the same lengthy and manual procedures of functioning, leaving them with no other option but just to watch their hard earned money & time getting wasted and resources lying futile, and worst of all finding themselves helpless to do anything about it. Ours is not just an after sales training schedule but a very well planned implementation program with noticeable results. So that you reap the best benefits out of the hard earned investment. Associating with us, we assure best of after sales support, training and implementation till the time you achieve the easy flow of day to day tasks while acknowledging the benefits that you acquire with the use of our applications.  Customer response indicates a 30% – 50% improvement in productivity.  Seamless integration between pattern design and grading systems.  Advanced error checking prevents catastrophic loss.  Training 100% – 200% faster.  Auto-marking system that equals or often surpasses human performance.  No information more than one mouse click away.  Sophisticated report export to Microsoft Excel and Word.  Built-in relational database interface.  Detailed pattern report with picture. Style CAD Pattern Making Software is one of the most user friendly programs available. Pattern makers who are proficient in StyleCAD have told us that Pattern Xpert is truly the very first CAD Pattern Design Program they felt they must have. No more manual pattern making and digitizing. So many pattern makers are now making patterns from scratch using Pattern Xpert. Not because they are told to but because they want to! Tools Like QuickStep allow you to save valuable time and effort. PDS : A high-performance pattern design and grading application that uses state-of-the-art technology. StyleCAD PDS provides all the flexibility and features to make mundane tasks much easier, and gives pattern makers more time to concentrate on their real business: design, pre-production and fitting. To resemble manual pattern making methods, Pattern Xpert has introduced very powerful drafting tools such as various type of guide line, powerful parallel line tool, rotate/flip tool, trim/extend tool and simple copy/paste operation. StyleCAD boasts the best curve quality among all CAD programs. Plotted curve quality is simply outstanding and has earned praises from users all over the world. Most curves are represented beautifully with just 2-4 curve points and the dragging behavior seems very natural to the user. Unlike some of the industry leading products, StyleCAD uses double precision floating point numbers internally to store data and the result is the most accuracy possible. Everywhere you look, StyleCAD is packed with time saving ideas. Typical time-consuming operations such as adding darts, curve blending, seams, manipulating seam corners and notches can be done in seconds. StyleCAD grading Software has all the advanced tools one would ever need. Grading ruffles is easy with the Radial Grading Tool and the Floating Notches. Matching piece length is easy with the Perimeter Grading Tool. Grading multiple cut pieces can be one of the most difficult tasks but the Intermediate Grading Tool makes it remarkably easy. 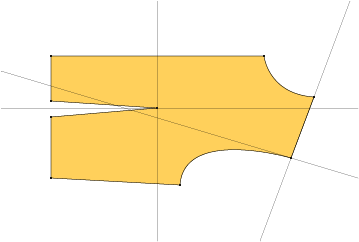 Grading armhole and sleeve pieces can be performed with precision with the Notch Grading Tool. Fancy but less frequently used Automatic Grading Tool allows grading an entire piece all at once by applying grading data from a similar piece. The most efficient Cost Saving, Fabric Saving & Time Saving Auto Nesting Software in the market. StyleCAD marker making system uses the most cutting-edge technology to increase efficiency, reduce costs, and increase productivity when creating markers. 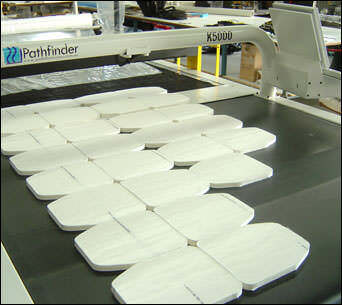 It also allows the user to use a wide array of automatic cutting machines for use with the system. 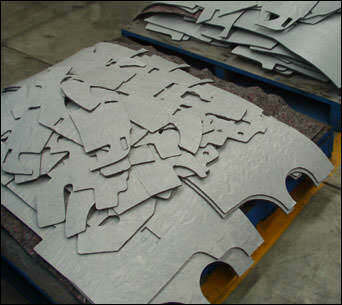 In addition, the user may quickly and easily set the cut direction and sequence control for pieces before cutting. The user may also set the lay direction by bundle, size, or one way. This allows for a completely customizable marking experience. Fabric represents a big part of the cost of manufacturing a garment. There is no other area in production that can provide substantial cost savings as easily as fabric control. Fabric contributes approximately 60-70% to the overall cost of the garment. StyleCAD has introduced a system for creating markers that is unmatched in its cost saving benefits. With ease of use and efficiency in the creation of fabric-saving markers, Our Maker Making tools have uncompetitive edge over other software’s Marker Making system also includes fabric pattern matching control, which allows users to correctly create pieces using fabric that has plaids, stripes, and 5-point references. This is perfect for any industry that requires matching fabrics on various pieces to one another. StyleCAD’s Automarker system allows the user to automatically nest a virtually unlimited number of pieces by using the powerful sectional marker feature. The system saves the 10 best nesting results as snapshots, allowing the user to compare results and view the progression of efficiency. The system also allows up to 5 additional marker widths and this allows the user to select the best fabric width for a given order. StyleCAD’s Automarker system also has many features that helps assist the operator in the autonesting process. For example, the operator may select the Partial Automarking feature to help combine the benefits of the user’s experience, as well as the computer’s processing power. The user may also load the job queue with an unlimited number of jobs and leave the system unattended while the computer does all the work.